Evolution 16.9 are interactive tile panels are part of an ongoing experimental research with engineers and other partners. My work combines fine bone china clay with minerals, metal, sulphates and other elements. The high firing of the bone china vitrifies the elements. The various panels emit coloured light which is responsive to different voices (young vs. old; male vs. female) and touch.“My idea is to create a ‘feeling’ between art and people with multi-media work by an App (artistic app). 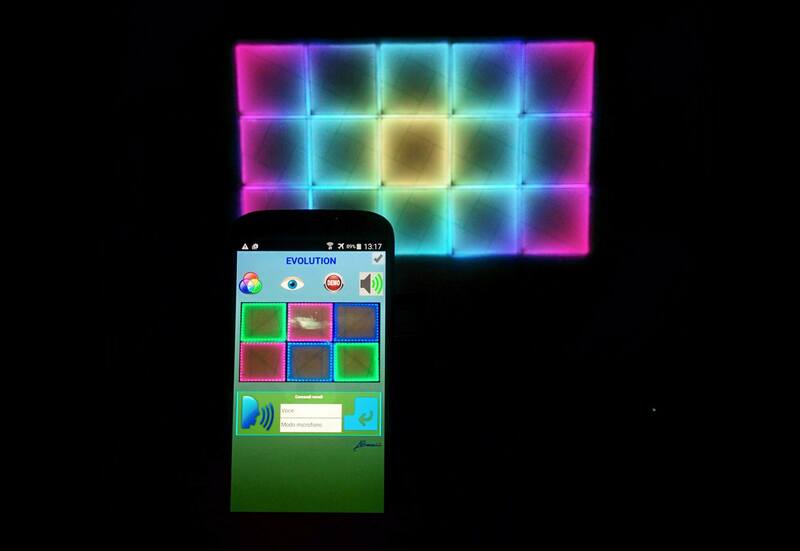 Evolution 16.9, interactive and multimedia ceramic panel with “ART APP” – Argillà – Faenza. I’d like to develop the possibility of new conception of contemporary ceramics 2.0 and try to create a new form of ceramic expression and ceramic evolution. Vernissage September 2, h 19.30 Statement of the artist Evolution 16.9 are interactive tile panels are part of an ongoing experimental research with engineers and other partners. My work combines fine bone china tiles with minerals, metal, sulphates and other elements. The high firing of the bone china vitrifies the elements. This entry was tagged argillà, argillà Italy, art app, boccini at masini theatre faenza, evolution ceramic, Faenza, interactive ceramics, multimedia ceramic, multimedia porcelain and art app. Bookmark the permalink.